This 5 star resort sits on a steep ridge overlooking a terrace of rice paddies with the mountains decorating the background. Sitting on top of the hills of Central Bali, it is a perfect location for the retreat leader seeking for something beyond Canggu, Seminyak or Ubud to try something different. This property is located away from the crowded areas of Bali, yet close enough to include Ubud as a day visit. With infinite, jaw-dropping views of the valley, feelings of peacefulness and tranquility will overcome you. Because of its unique location at 1,000 meters above sea level, temperatures are cool and fresh. It is an ideal location for retreat leaders who would like to host wellness retreats that include: workshops & seminars; activities that focus on nutrition and agricultural or retreats that will be geared for parents traveling with children. With 89 luxurious guest rooms across the property, this is an ideal venue for larger groups. There are 6 categories of rooms. There are 24 standard retreat rooms, of which 10 provide Twin Beds. These rooms measure from 34 – 39 sq meters and offer an en-suite bathroom with a rain shower. There are 24 spacious Deluxe rooms, of which 4 provide Twin Beds. These spacious rooms measure 46 sq meters and offers a larger bathroom. All rooms are beautifully decorated and come with central a/c, a 42” LED TV, locally sourced room amenities, fully stocked mini bar, complimentary Wi-Fi and stunning views from your outdoor balcony. There are various options for group sessions, such as the wooden floor yoga studio that overlooks the valley and the mountains. This yoga studio also comes equipped with 8 hooks to hang yoga swings. This yoga shala measures 135 square meters and can fit 25 people using yoga mats. There are 2 yoga swings for use. Additional spaces for group sessions include an expansive wooden roof top deck where morning class sessions such a Tai Chi may be hosted. For workshops and meetings, this venue also offers a convention area with 3 adjustable meetings rooms. The gym comes with top quality Precor equipment and is open to use for in-house guests. There are two restaurants serving special menus with an emphasis on healthy dishes. Dishes are a blend between Indonesian, Western and local specialties. The venue prides itself in using locally grown produce. Special menus can be catered to, upon prior request. The infinity fresh water pool is set amongst the well-manicured grounds of the property. Adjacent to the pool is a large Jacuzzi offering plenty of space for everyone. Children activities such as art classes, Balinese Dance classes, etc are also provided, making it ideal for parents joining a retreat. 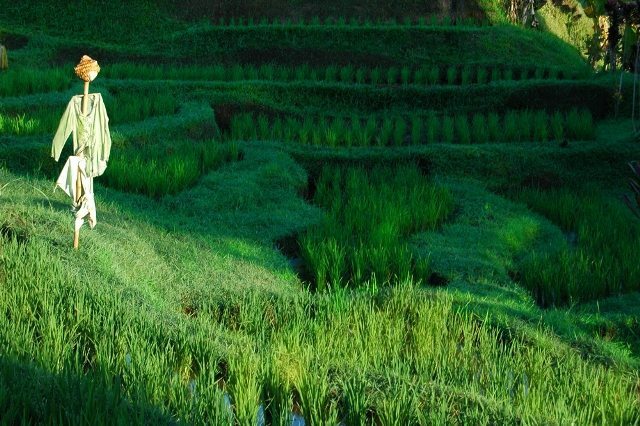 Additional excursions, such as: visiting organic farms in the area; cultural visits of Mother Temples; playing golf; bathing in the waterfalls; day visits to Ubud etc may be including in your retreat. Several additional excursions may be added to your retreat because of this properties central location within Bali.